Cycling Medals for Sale - Gold, Silver & Bronze - Buy here at Aford Awards! If you’re in need of cycling medals for your cycling club or team, which are top quality and value-for-money then look no further. Here at Aford Awards we’ve been supplying medals to cycling clubs, schools and tournament organisers for over 30 years and have gained a reputation as one of the leading cycling medal suppliers and engravers in the UK. We pride ourselves on the excellent quality of our products, as well as our unrivalled customer service. We also aim to ensure you always get the best possible deal. So browse our fantastic range of quality cycling medals and we guarantee you’ll find exactly what you’re looking for. 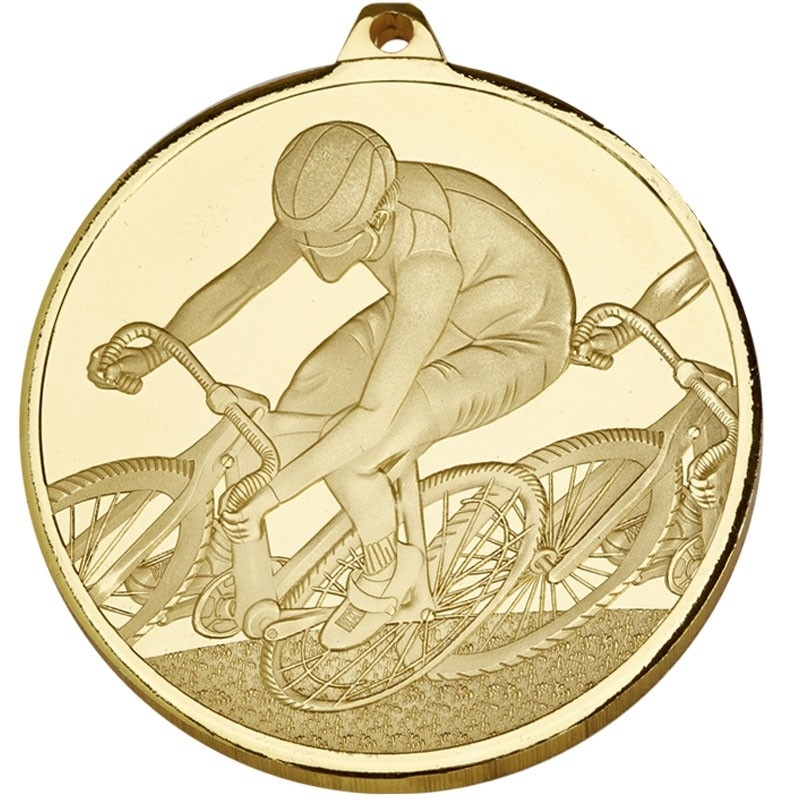 At Aford Awards we offer a wide range of cycling medals for all different types of achievements and occasions. Whether you’re looking for a cyclist of the year award or a best cycle club medal then our online store has everything you need to make your cycling event or awards night a truly special occasion. As well as our wide range of classic medals, we also offer a huge selection of crystal cycling trophies and cycling trophies that will add that extra touch of class to your awards ceremonies and presentations. Each one of our cycling medals is made from the top end materials, so they will look great on your awards shelf for many years to come. All cycling medals can include your own personalised club badge or tournament logo as an additional option if required. As well as offering a massive selection of top quality trophies, medals and cups, Aford Awards also make it our mission to give you the best prices you can find online. In fact, if you can show us an identical cycling medal or trophy that is available at a cheaper price, we won't just match that price - we’ll beat it by 5%. To find out more on how we guarantee our customers the cheapest trophies anywhere online, please read our price promise page. We offer free engraving/personalisation on all our trophies, cups, medals and crystal awards. Free logo engraving and text is also available on all our silver and nickel-plated cup ranges. If you need something else personalised, take a look at our premium engraving service. Our cutting-edge engraving equipment can personalise items such as watches, jewellery, lighters and tableware, as well as trophies you have purchased elsewhere. Feel free to get in touch if you have any enquires about our cycling medals or any other products or services. Any one of our team will be happy to help. Alternatively, if you’re looking for trophies or medals for another sport, check out our sports trophies page and bespoke medals page, where you'll find everything from motorsport trophies to golf trophies and crafting your very own cycling medals!